Christopher McDougall was quoted as saying, “If you don’t have the answers to your problems after a four hour run, you ain’t getting them.” This could not be more true. I knew it was a run I needed. The ability, the willingness to push myself; to be tired at the end and to allow the solitude of the moment to wash over me and renew me like the shower that I cherish when my run has been completed. When I woke this morning, there was something in the air; something which suggested this morning would be different. Perhaps it was the sun creeping toward the horizon indicating its presence at least for part of my run. As I packed my gear ready to drive toward my starting point, I ran back into the house and grabbed my sunglasses. You see, In Western New York the sun makes rare appearances during the winter months. A few minutes of the orange rays provides for me the hope life will go on and happiness can be found. The road beckoned and I must go. I must follow the path toward inner happiness and remind myself of the importance of finding that happiness despite the tragedy of the the previous day’s events. I new a run this morning would help me achieve this peace; a peace which if allowed by me would adhere to me like a warm coat throughout the remainder of the day. I packed my gear, started my car and scraped the ice from the windows. As I drove to the start, my encouragement for sunshine and my excitement for the start of my run grew. The radio remained off, my only accompaniment the sound of the tires as they rotated beneath my car. I arrived at the parking lot and smiled as I realized I was the only one present. Once I arrived, I zipped my jacket, donned my backpack, pulled my knit hat down over my ears, pulled on my gloves, pressed the timer on my watch and began my session of solitude. i focused and found my rhythm; my stride and breath in sync; feeling as one. Within a few miles I reached the North campus of the University at Buffalo. I rounded the curve to see an orange haze coat the grass which had been painted with the frost of the morning. Another quarter mile caught me by surprise as I encountered the source of this orange haze. 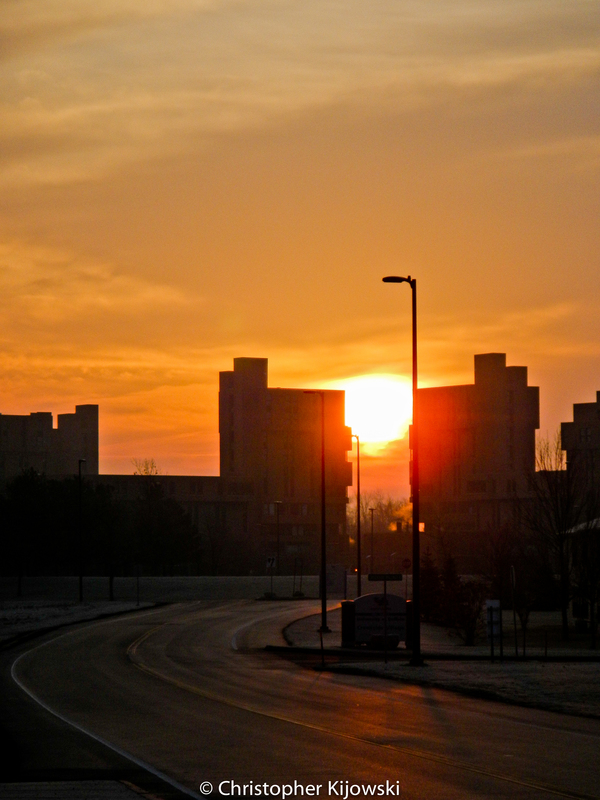 I stopped and watched as the sun rose between two buildings on this beautiful campus. The peacefulness of the campus at this time of day enveloping me and shielding me. I continued my run across the campus, thoughts of yesterday’s activities in Connecticut firmly held in my memory. These thoughts were difficult to shake much like the cold temperatures through which I was running. I became aware of tears which fell from my eye freezing to my eye lid. As I left the campus, so did the memories. My run now became one of solitude and thought. When I run and everything feels as it is one, thoughts come and go. None stay with me for more than a few steps. The synchronization which I feel has increased and my thoughts have joined this rhythm. Every few steps produce a new thought and the next few steps erase those same thoughts. My steps feel lighter and I become barely aware of my feet even contacting the ground. There are no answers, at least easy ones to explain what took place in Connecticut. There will be fights and arguments about gun control for decades to come. Politically charged debates will take us farther from the answers and serve only to separate us to a greater extent. Eventually these too will decrease until another unfortunate scenario, reminiscent of this one, rears its ugly head. My run has taught me I have no answers to these questions of life; at least not one’s which others find acceptable. This run, like countless others serves as a reminder to me that I only have the answers which serve me directly. I remind myself of the importance to live my life in a compassionate manner. The Buddha said, “All sentient beings possess Buddha nature. Because of that, we have this natural purity, peacefulness and power.” This is also what my run teaches me. My run also reminds me of the importance to keep an open mind so these lessons of life are not forgotten. My run has reminded me of the Buddhist teaching which is based on the precepts of refraining from killing and causing harm. Buddhist teaching is also based on compassion and mutual care as well as respect for all sentient beings regardless of class, caste, race or creed. My run, this day and all days, reminds me of the importance of living my life in a respectful manner. There are lessons to be learned all around us everyday. We need only be open to hearing the lesson and owning our response. I enjoy reading your blog. You have such a positive attitude toward life! You are blessed to be at such peace.Your writing has an enormous amount of depth and is truly inspirational!! It is wonderful to read! Thank you Lisa for your comment and continued readership & support.